A moment of the semi-final match of the Bangabandhu International Gold Cup Football Tournament between Bangladesh and Palestine at the Bir Shreshtha Shaheed Ruhul Amin Stadium in Cox's Bazar on Wednesday. 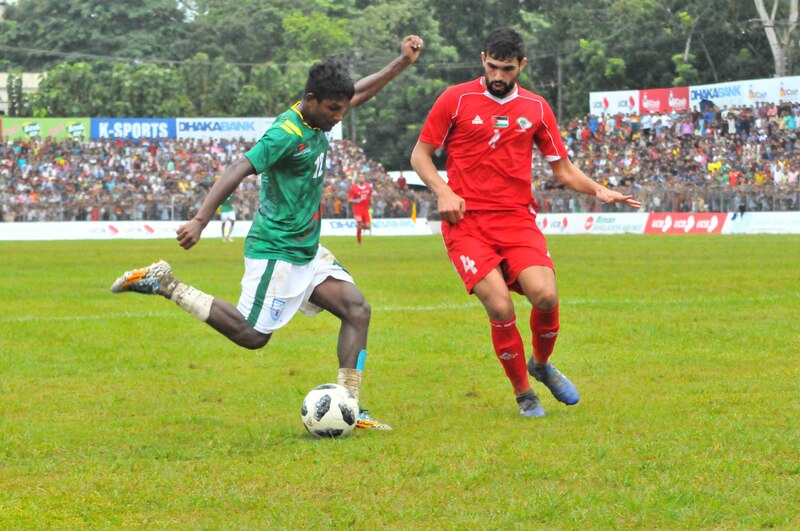 Bangladesh's hope of playing final of the prestigious Bangabandhu International Gold Cup Football tournament vanished into blue as they suffered a 2-0 goal defeat to strong Palestine in their second semifinal held on Wednesday at Bir Shreshtha Shaheed Ruhul Amin Stadium here. With the win Palestine confirmed their final spot and they will meet first semi-final winners Tajikistan in the title deciding battle scheduled to be held on Friday at country's premier venue Bangabandhu National Stadium in the capital. Prime Minister Sheikh Hasina is expected to present in the final as the chief guest. In the day's match, Mohammed Balah opened an account for Palestine early in the 8th minute while Sameh Maraaba sealed the victory scoring the second goal for Palestine in the 90+4th minute of the match. Bangladesh, however, conceding early goal tried to stage a fight back but they failed to score any goal in front of fifteen thousand capacity jump-packed stadium. Earlier, Bangladesh finished group B runners-up when they beat Laos by 1-0 goal and suffered a solitary goal defeat to Philippines in their last group encounter. On the other hand, Palestine beat emerged group top after beating Tajikistan by 2-0 goal in their group opening match and edged past Nepal by 1-0 goal in their group second match.